This project is as simple as it gets. It's one of those things you see all over Pinterest and think "Oh, that's so cute! I should do that to de-clutter my make up bag!" but you never get around to it. Buy a vase or jar...fill it with rocks, pebbles, coffee beans, sea shells, etc. Now stick your make up brushes, paint brushes, pencils, pens, scissors, art supplies, etc in it! The possibilities are endless with it too. 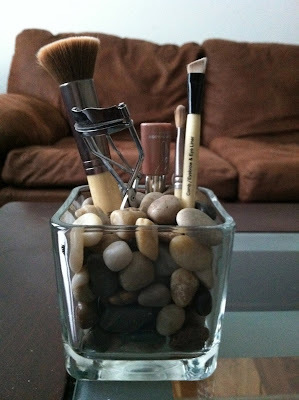 You can use any kind of jar or vase that works with what you're putting in it and then use any kind of filler you want. Heck, you could get a large vase, fill it with dried pinto beans and stick your kitchen utensils in it! How cute would that be? Or maybe even colorful dried heirloom corn? How about filling it with beads and sticking craft scissors in it! Or even for a child's play room, fill it with marbles and stick their markers in it! So many choices! What combo would you do? What area of your house would it help to organize? P.S. I may not get around to posting anything tomorrow as my husband and I will be celebrating our 1 year anniversary on a weekend trip!! So excited! !